Champion on Porete Avenue in North Arlington, New Jersey. The far side of the building included the foundary where the parts for the Champion Crushers were cast. 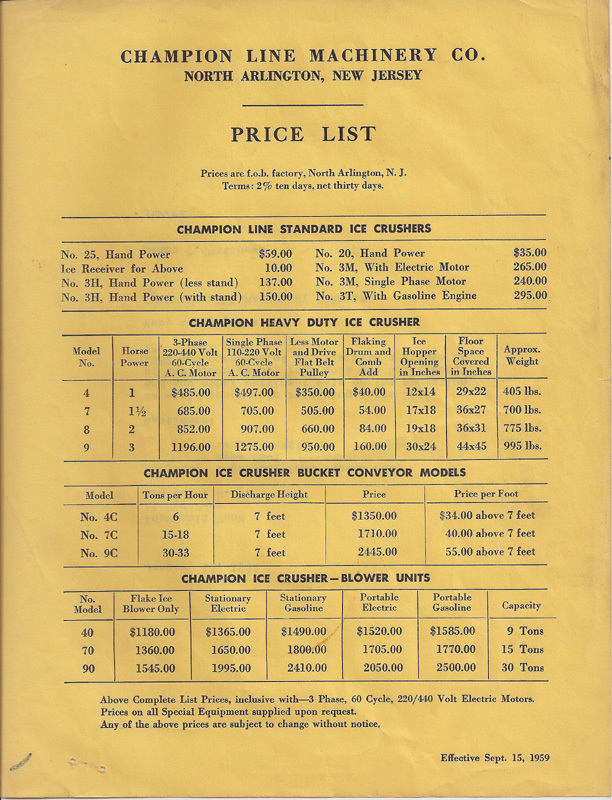 In 1906 the late John H. Matthews began his vision with Champion Line Machinery’s commercial/industrial duty Ice Crushing and Shaving machines. He opened a foundry in North Arlington, New Jersey, and every individual component was made there except the electric motors. He wanted to expand the business, so he started selling used processing and packaging equipment as a side line. 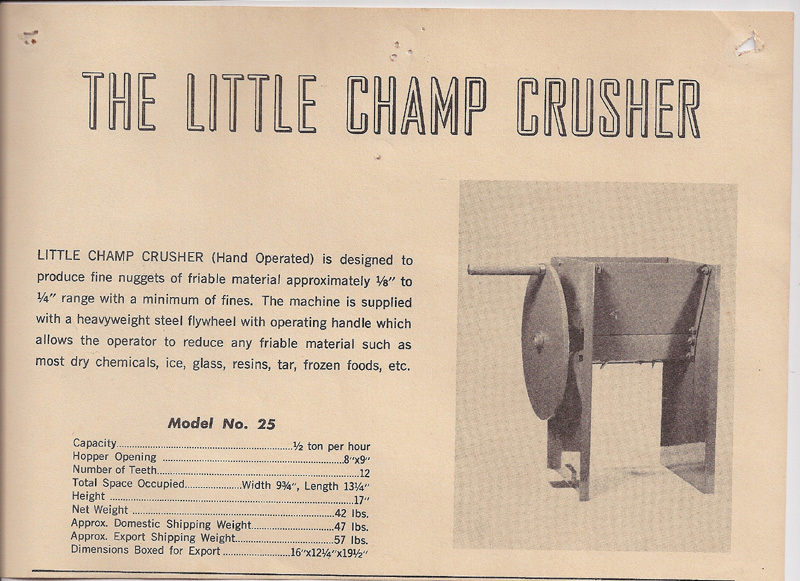 He continued to sell new ice crushers, which were excellent sellers in the commercial fishing industry. 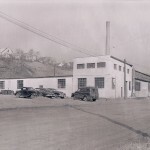 In the mid-forties the late James T., John R., and Vincent Matthews began working for their father in the family business. John quickly picked up welding and machining skills from his father, and, with his staff, built and assembled the Champion Crushers. Vincent, a Professional Engineer who earned his Masters from Rutgers University, was responsible for doing the engineering and drawings. He went on to re-design the #3 Champion Ice Crusher. James, a graduate of Farleigh Dickinson University, joined the business shortly before their father passed away, leaving the three brothers the business. 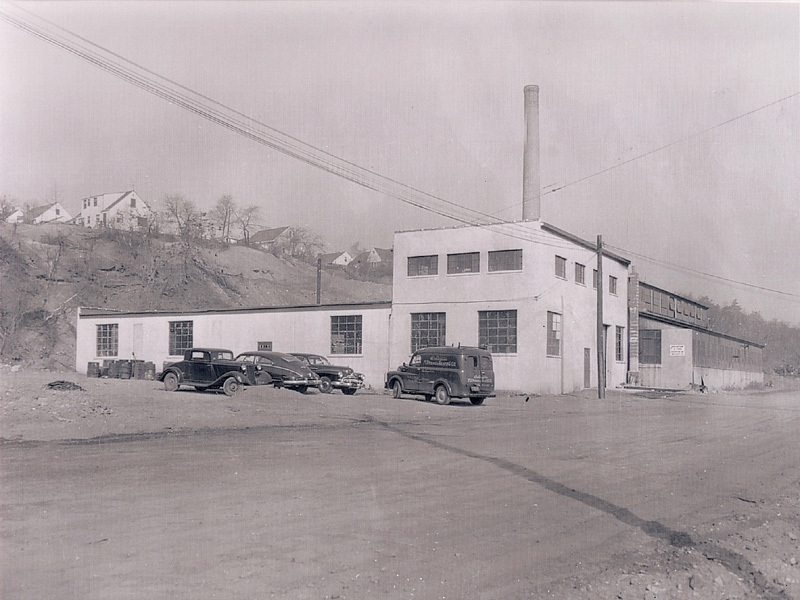 The three brothers worked hard and relocated the business to Bonny Dell Industrial Park in Rutheford, New Jersey. 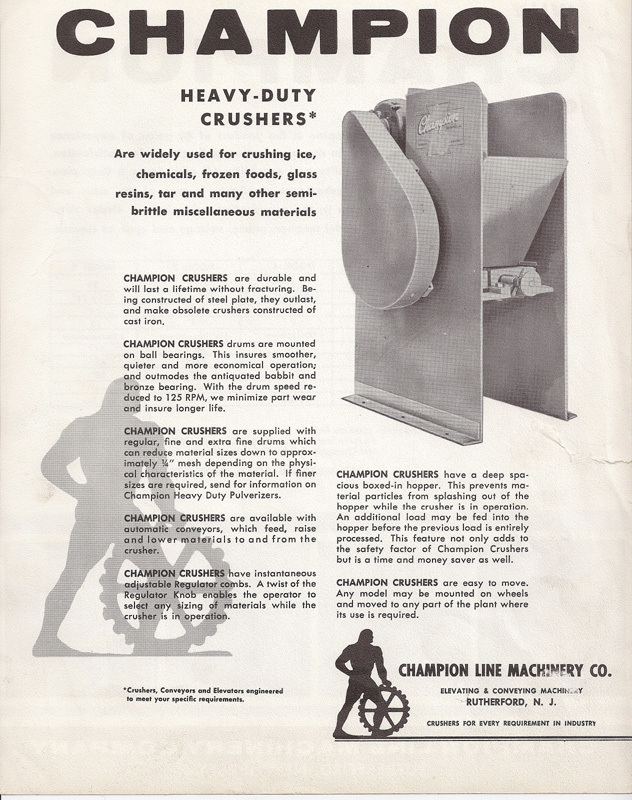 By this time Champion was primarily engaged in re-selling and re-manufacturing used processing and packaging equipment, but they still made and sold Champion Crushers to Food and Chemical Companies. 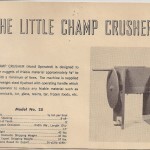 Nestle™ corporation still uses a #3 Champion Crusher for their chocolate. 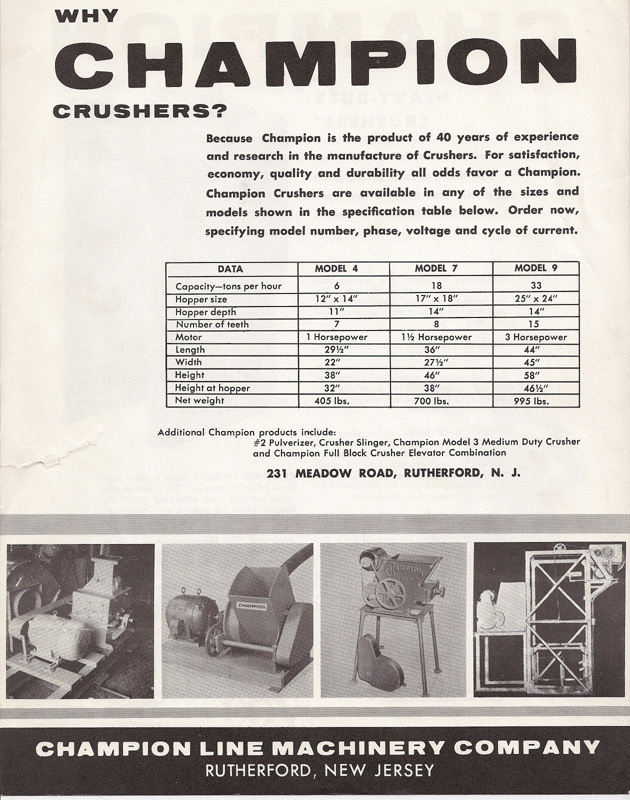 James, Vincent, and John expanded Champion’s machine shop and fabricated everything from Conveyors to Ribbon Blenders. 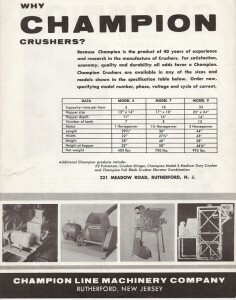 In 1973, as modern refrigeration technology improved and the demand for for Champion Ice Crusher/Slingers slowed, the company changed its name to Champion Trading Corporation. James’ sons Jim Jr., David, and Michael began working for thier father on weekends and their days off, learning every detail of the business their grandfather had built. 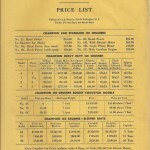 After all three boys had finished college they began working at Champion full-time. Today, this third generation of Matthews run Champion Trading Corporation. 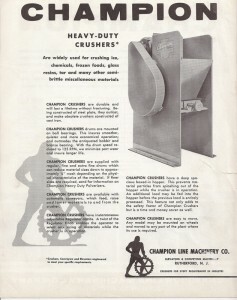 Champion Trading Corporation has everything from a computerized inventory to a fully-staffed machine shop for our customers’ convenience. Our over 18,000 square-foot warehouse is located in Marlboro, New Jersey on State Highway 79. We are capable of in-plant removal of your used equipment. We own and operate service and delivery vehicles for local and service needs. Our machine shop is well-equipped with the latest machine tools for re-manufacturing and re-building any equipment which requires service or needs custom modification for the customer’s industry. We also offer consignment services for your high-valued equipment. We also buy or trade equipment. We carry everything form cappers, to wrappers, to tablet machines. We are one of America’s oldest used processing and packaging equipment dealers. Why not stop by our facility and see what items can be used for your industrial needs?